A fascinating story recently discovered reveals an unpleasant incident that occured at George Musgrove's home in Navestock. 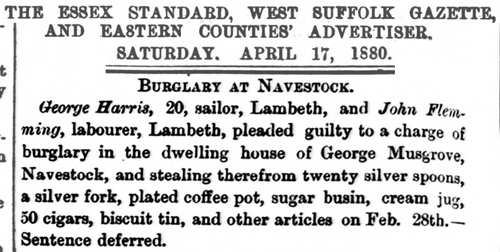 The newspaper reports shown left explain how on the 28th February the Musgrove's home was burgled by 2 men. One of these was named as George Harris, a sailor from Lambeth. What is not stated is that he was infact Emily Musgrove's younger brother aged 19. 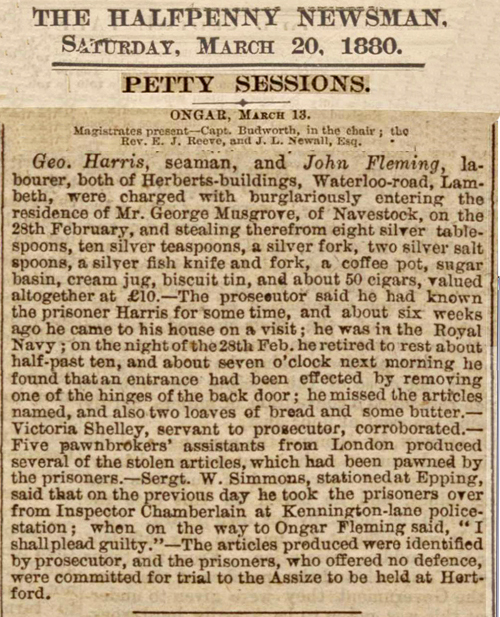 George Harris was brought to trial at Hertford Court and pleaded guilty. He was sentenced to 1 years in prison with hard labour. A copy of the court book is shown below with an extract of the 1881 census showing George Harris still in prison in March 1881.